So it was Greg's birthday yesterday. So I threw him a surprise party. That's the seventh surprise party I've thrown for him since we met 11 years ago. to have a bunch of our friends over to hang out. the 12 adults enjoyed conversation, beverages and corn hole. 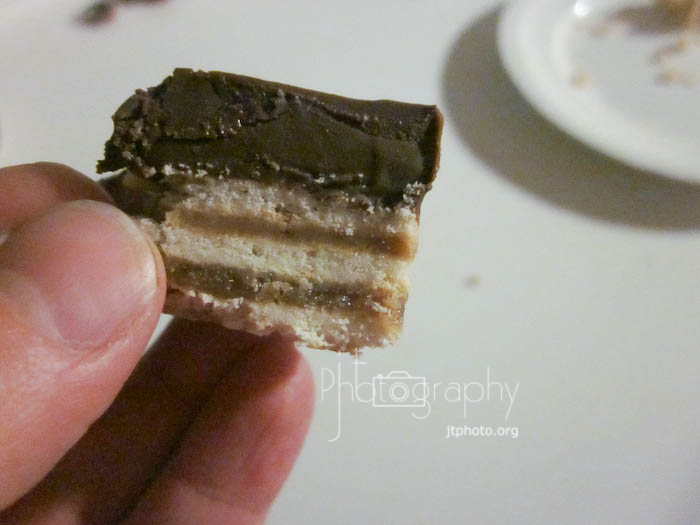 The favorite dessert of the night was the kit kat bars I made. 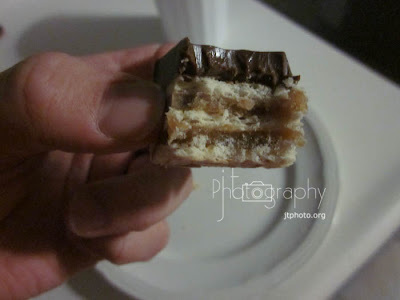 they don't really taste just like kit kat bars but they're super yummy! Butter a 9 x 13 baking dish. Line with a layer of 20 crackers. In a small saucepan, bring butter, sugars and milk together to a boil over medium heat. Stir in crushed graham crackers. Let boil 5 minutes. Pour half of the sugar mixture over the crackers. Cover with another layer of 20 crackers, pressing down lightly. Pour remaining syrup mixture over crackers, smoothing to coat. Top with the remaining crackers, pressing lightly. Pour evenly over the top layer of crackers, making sure the crackers are completely covered. Refrigerate until kit kat bars are firm. I also added 1/2 cup of butterscotch chips to the topping.